Top of the line thyratron tubes manufactured in the United States by renowned General Electric. 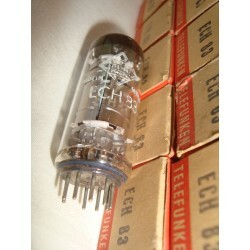 These glass shoulder type 8 pin octal based tubes come with black plates and side getters. Designed for switching and relay applications, these tubes are printed on base with GE logo, ELECTRONIC TUBE with various production codes. Boxes are standard GE orange and grey printed 2050.